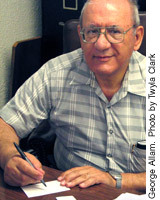 George Allam was born in Damascus, Syria and immigrated to the United States in 1960. A talented artist, George’s work shows the beauty of Arabic script. Islamic forbidding of icons and statues gave rise to calligraphy as a way of showing adoration to a person. George emphasizes the use of these characters to convey a phonic translation instead of a literal translation. He is valued in Wisconsin’s Arabic community for creating representations of poetry, proverbs, family names and verses from the Quran that people hang in their homes, cars and offices. In a presentation, George will combine his extensive knowledge of the history of Arabic calligraphy with demonstrations of the techniques used to draw Arabic script.